London: Pr. for the Nonesuch Press, 1931. 8vo (22.7 cm, 8.9"). Frontis., xix, 135,  pp. ; 32 plts. (1 fold.). First edition of this authoritative reference work on the essayist and literary critic, written by the great British surgeon who pioneered blood transfusions and a rational approach to breast cancer. He was also a noted book collector, bibliographer of Blake, brother of the economist Maynard Keynes, and the man who saved Virginia Woolf's life following her first (i.e., 1913) suicide attempt. 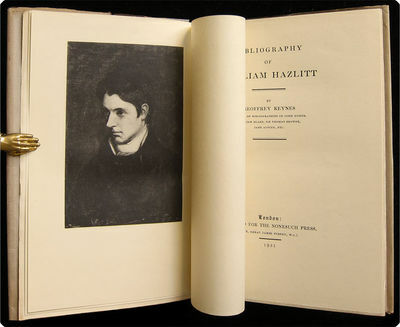 The volume is illustrated with reproductions of many of Hazlitt's first edition title-pages, as well as a portrait and a folding facsimile of one of Hazlitt's letters. This is => numbered copy 298 of 750 printed by R. & R. Clark in Edinburgh for the Nonesuch Press, with the four collotype illustrations printed by the Chiswick Press.